Brazil’s sugar and alcohol industry is suffering as a result of low prices, and investments have dried up. But the world cannot survive without more sugar from Brazil, so the situation is expected to improve soon. With the world sugar price low for the past three years and with alcohol fuel having to compete with subsidized gasoline in Brazil, the country’s sugar and alcohol industry is going through a difficult patch. But with no competing country in a position to take Brazil’s place, it is only a matter of time before the industry bounces back. Brazil’s exports of sugar, both raw and refined, increased from less than 7mt (million tonnes) in 1997, to peak at almost 28mt in 2010. But with many mills now facing financial difficulties and with plantations suffering from adverse weather in the past three years, output has stagnated and growth will not resume for some time. Half of the 50mt of sugar carried by sea each year, has been Brazilian in the past few years, while a quarter of the total grown worldwide has been produced there as well. As well as sugar, about half of the cane grown in Brazil, up from about 330mt in 1997, to twice that much in the past few years, is now distilled into alcohol fuel. Until about 30 years ago, most of the 2mt of sugar exported by Brazil each year, was grown in the north east region and exported from Recife and ports in Alagoas state. But since then, Sao Paulo has gradually become the leading producing and exporting state. About 80% of the sugar is now exported from Santos, most of the rest leaves from Paranagua, with about 2mt shipped from ports in the north east. Worries that not enough oil might be available to meet fast- growing demand for motor fuel, notably in developing countries such as China, as well as concerns about pollution, encouraged a new round of investment in renewable fuels a decade ago. Convinced that much more renewable fuel, of which alcohol made from sugar cane is the cheapest and easiest to make, would soon be needed, numerous companies set about building up to 100 large new mills, many designed to make only alcohol. With land in Sao Paulo state now extremely expensive, most of the new mills were built to the west, north and south of Sao Paulo, further from ports and the most populous cities. Although demand for renewable fuel has grown fairly fast, if erratically, many countries decided that they did not want to become as dependent on imports of these fuels as they were on crude oil. Most decided to use local raw materials instead of buying low-cost alcohol from Brazil. This presented mills in Brazil with a dilemma, as huge quantities of extra alcohol were being produced, with no obvious destination. Brazil’s motor industry came to the rescue and a new generation of engines able to run on any fuel, ranging from 100% gasoline to 100% alcohol, or any blend of the two, were developed, with ‘flex’ cars launched in 2003. But mills were forced to sell the alcohol cheaply to get rid of it. To be competitive, the fuel must cost not more than 70% of the price of gasoline, which has been subsidized in Brazil in the past few years in a fruitless attempt to hold down inflation. If selling below cost got rid of surplus alcohol, it made the financial situation of companies which had built the new mills with borrowed money, extremely precarious. The situation was eased temporarily after most of the world’s large trading companies which negotiate much of Brazil’s sugar decided to buy into the industry. Dreyfus was followed by Bunge, Cargill, ADM and Noble, while several large oil companies, notably Shell and BP, as well as Brazil’s Petrobras, followed suit. Unfortunately for the industry, the Brazilian government, initially a keen supporter of Brazil’s ambitions to become the ‘Saudi Arabia of ethanol’, soon had other priorities. Raising the living standard of the less-well-off in Brazil, by increasing wages and pensions faster than the economy grew became increasingly important, while the discovery of largereserves of crude oil encouraged politicians to switch to supporting the oil industry. The growing financial difficulties of the mills coincided with the sharp fall in the world price of sugar, after a period when high earnings from sugar exports had been the saving of an industry being forced to sell alcohol at a loss. The net result of low prices of both sugar and alcohol, coupled with a sharp rise in costs, has resulted in the financial situation of all but a few mills deteriorating to the point that the industry’s total debts are now larger than its annual income. In the past five years, about 50 mills have closed down. Many more are virtually insolvent, and are expected to close their doors soon, as there are no buyers at the moment. To reduce pollution, it was decreed a few years ago that burning ripe cane before manual workers cut it, must be phased out by next year. The solution has been to switch to harvesting cane by machines, each machine taking the place of 80 manual cutters. The high cost of these machines, plus that of the special vehicles needed to carry shredded cane to roadways, has cost the industry about US$8 billion in the past few years. This is money the cash strapped industry could ill afford. The measures aimed at distributing income have allowed the living standards of at least 35 million Brazilians to increase dramatically in the past few years, giving a boost to many industries and creating millions of new jobs. About three million new cars have been sold in each of the past few years, twice the previous number. One result of this has been that the amount of motor fuel needed has increased by about 8% each year. Brazil used to export surplus gasoline, but billions of dollars now have to be spent on importing more of the fuel each year. Under pressure from rising inflation, the government has refused to raise the price of gasoline to keep pace with the increase in the price of crude oil. A 16% subsidy for gasoline has placed a ceiling on the price at which alcohol can be sold, at the same time as revenues from sugar exports have stagnated. The enthusiasm of trading companies for the sugar industry has fallen fast in the fast couple of years. Bunge is considering selling all its eight mills, while Dreyfus made an operating loss last year and is to shut at least one mill. Others may follow suit. Raising the living standard of the less-well-off in Brazil, by increasing wages and pensions faster than the economy grew became increasingly important, while the discovery of large switch to building new roads instead. 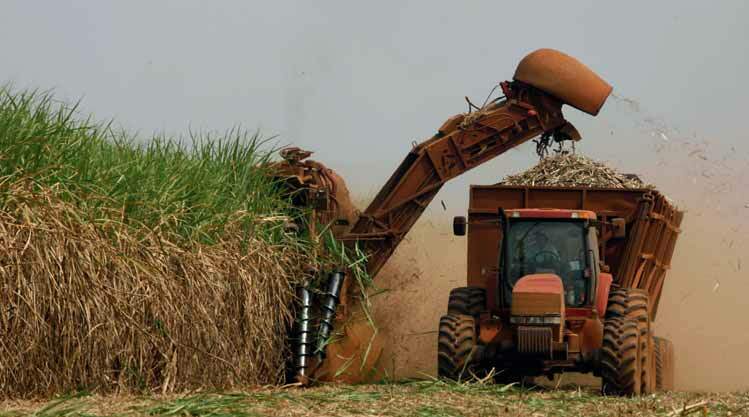 To keep pace with anticipated growth in world demand for sugar, now increasing by about 2% a year, as well as to make sufficient alcohol to fuel half Brazil’s car fleet, at least 100 large new mills need to be built and 600,000 hectares of extra cane planted each year. But in the present difficult situation, nobody is planning to do either. Rather than 20% of existing cane being grubbed up and re-planted each year, essential if yields are to remain high, cash- strapped farmers are renewing as little cane as they can get away with, which will compromise future production. Analysts suggest that there will be a shortfall of up to 40mt of cane just this year. This will mean that Brazil’s share of what is traded, which has already slipped from more than 50%, to about 47%, will fall further from now on. What happens next is anybody’s guess. For the time being, none of the world’s other players in the sugar industry, such as India, Australia or Thailand, has sufficient spare land to take Brazil’s place. It will be a very long time before countries in Africa are able to take up the slack, so sugar prices are expected to start rising soon, as demand exceeds supply. In the past few years, Brazil’s exports of refined sugar have stagnated, while those of raw sugar have grown fast. With abundant supplies of low cost oil or gas, numerous countries in the Middle East and North Africa can refine the product much more cheaply than Brazil can now do. Countries such as Saudi Arabia and the UAR buy the majority of the high quality raw sugar which is Brazil’s speciality. It is shipped through large new terminals equipped with the latest shiploaders and carried in far larger vessels than in the past, loaded in a fraction of the time it used to take. Although the industry is going through a difficult patch, this is not the first time this has happened, and executives point out that the industry is cyclical. They expect the world sugar price to rise again soon, while alcohol fuel may well make a come back sooner rather than later.